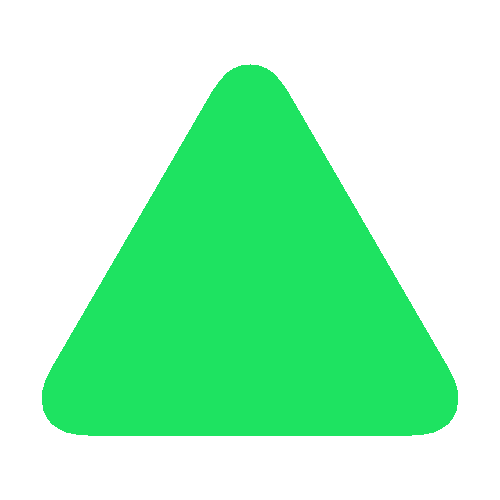 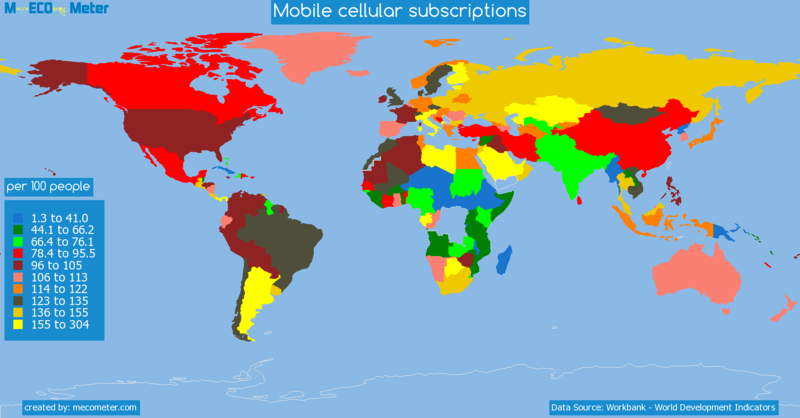 Value & RankThe Mobile cellular subscriptions of Israel is 123 (per 100 people) with a global rank of 62. 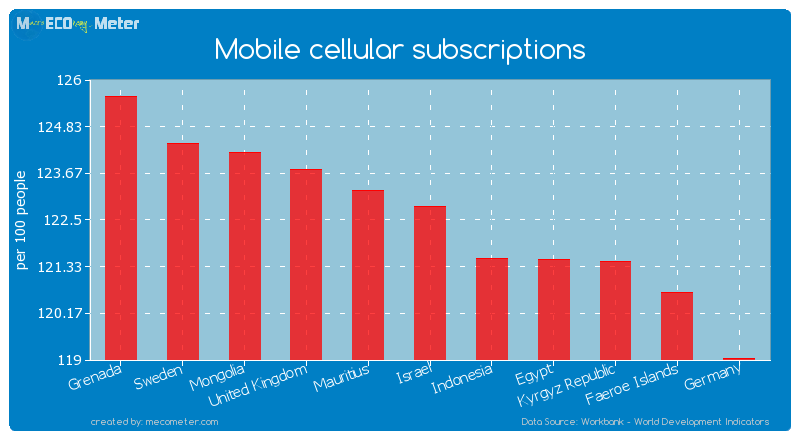 Israel compared to other CountriesThe Mobile cellular subscriptions of Israel is similar to that of Grenada, Sweden, Mongolia, United Kingdom, Mauritius, Indonesia, Egypt, Kyrgyz Republic, Faeroe Islands, Germany with a respective Mobile cellular subscriptions of 126, 124, 124, 124, 123, 122, 122, 121, 121, 119 (per 100 people) and a global rank of 57, 58, 59, 60, 61, 63, 64, 65, 66, 67.10 years growthIsrael's Mobile cellular subscriptions had a positive growth of 17.9 (%) in the last 10 years from (2003 to 2013). 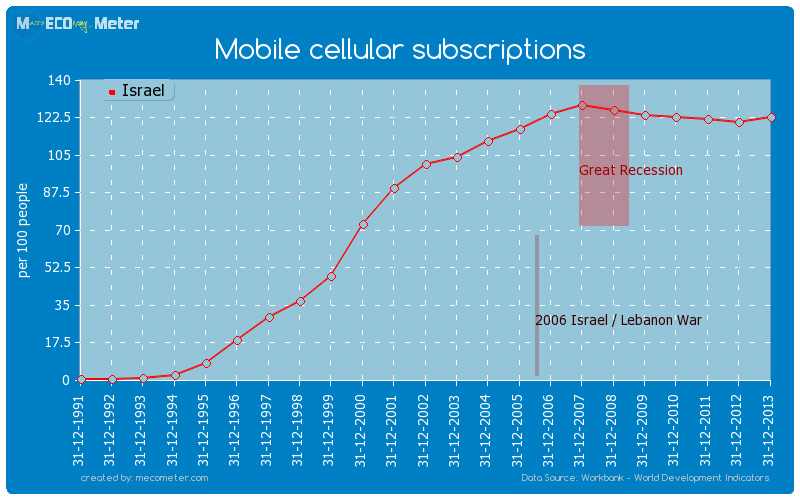 Last 10 years averageIsrael had an average Mobile cellular subscriptions of 120 (per 100 people) in the last 10 years from (2003 to 2013).